Good, substantial brick edifice, 55' wide and 86' long, two stories high; building comprises a spacious hall in the second story with a small gallery balcony & four ante-rooms. On April 7, 1855 a vote to divide the town into two separate communities took place. Approved on April 10th, the terms of the agreement were adopted at town meeting on November 19, 1855. 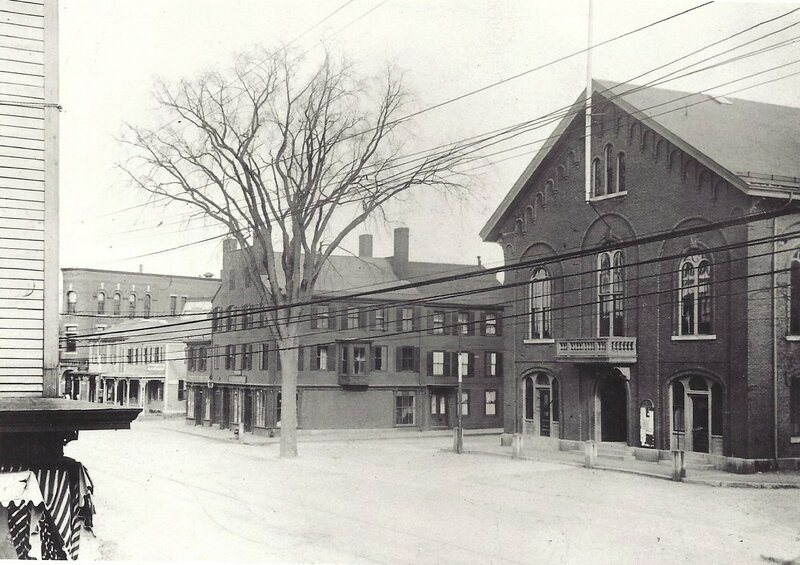 The town meetings were held at Henry Barnard’s furniture warerooms on Essex Street in the former Andover & Wilmington Railroad depot which eventually became the Andover Playhouse movie theater. The March 3, 1856 Town Warrant article #21 proposed building a Town House. A committee was chosen to investigate the subject and report back at a future meeting. Three sites were considered; the current location of our library, the Musgrove lot and the one chosen at 24 Main Street. 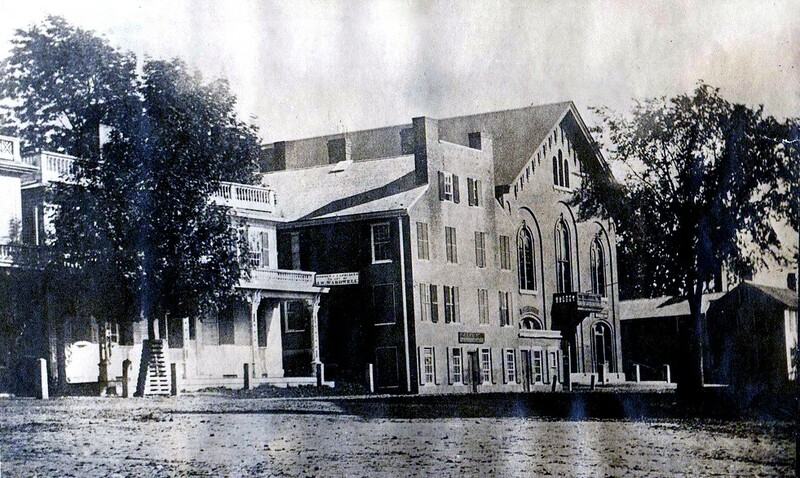 On March 1, 1858 Town Meeting article #16 authorized the construction of the Town House at a cost of $15,000. April 10, 1858 Andover Advertiser (AA) - STAND FROM UNDER! We are pleased to learn that the Town House Committee purchased for its location of W. Phillips Foster, the vacant land opposite the Andover Bank. The lot consists of about three fourths of an acre. Price $2000 ….. It is intended to have the building finished before the first of November. The land was purchased from Wm. Phillips Foster who owned the brick house and store at 18 Main Street. The Foster lot was once the front yard of the property formerly owned by Col. Benjamin Abbott prior to Foster ownership. The empty lot once belonged to Mark Newman who sold to Col. Abbott in 1818. May 29, 1858 AA– Town House – Plans & specifications for the Town House, by Theodore Voelckers, Architect, are now in the hands of the Committee. They intend to advertise proposals for building forthwith. Workmen have already begun to dig the cellar and put in the foundation. June 19, 1958 AA– Messrs Abbott & Clement have contracted for building the Town House – total cost $15,000 to be completed by November 1. July 24, 1858 AA- Town House – The cellar wall of the Town House is nearly completed. Messrs. Bancroft & Callahans, the contractors, have done it to the entire satisfaction of the Committee. It is about two and a half feet thick, laid in cement, and very substantial. Amount paid them $560. The underpinning is to be put in immediately, and Messrs. Farnham & Gile, who are the contractors for the mason work, will commence laying brick next week. Sept. 4, 1858 AA – Town House – The walls of this building are up and the carpenters are putting on the roof. It will be completed, judging by the progress already made, in about six weeks. Architect Theodore Voelckers of Boston also designed the first Punchard Free School building. Local contractors Abbot & Clement were hired for the town house construction. Bancroft & Callahan built the foundation and Farnham & Gile did the brick masonry work. The original floor plan design had two stores in front flanking the main entrance. There was a large lower hall to the rear with meeting rooms between for selectmen to conduct town business. On the upper floor was a spacious hall with a small gallery (balcony), and four ante rooms. At a special Town Meeting held on Dec. 20, 1858 – Report of the Building Committee – total expense $15,321.49 The Town House was dedicated on December 30, 1858. Dec. 25, 1858 AA – Dedication of the Town House on Thursday afternoon on 30th inst. At 2 o’clock – Address by Hon. Alfred A. Abbott of Salem. Sept. 3, 1859 AA – The walk in front of the Town House is well under way. It will consist of three stone stringers, with the intermediate space paved, and the pavement to extend two feet beyond the stringers on each side; making the whole breadth of the walk twelve feet. The lower meeting hall was used as a local court room and served as the town high school from January 1869 to June of 1871 after a fire destroyed the Punchard school building. In 1863 a cupola or belfry was to be added to the town house as designed by Theodore Voelckers. The contract with construction specifications was written and sent by Voelckers to the town dated December 22, 1863. All work was to be completed to receive the bell in 1864. The contract was never signed and the belfry never constructed. The town voted to build an addition to the rear of the building in 1881 to enlarge the Town Hall. The improvements included; a new stage, two rear staircases for better egress, improved ante rooms for club meetings and a kitchen for cooking accommodations. The seating capacity was increased by nearly 100 seats. The contractors were Abbott & Jenkins of Andover the cost being $6250. A delay in procuring brick to match the original building pushed the completion date to 1882. August 19, 1881 AA - The brick furnished for the townhouse extension proved to be larger than those in the main building and it is found necessary to suspend work until another supply is obtained. September 16, 1881 AA - The laying of the brick on the town house extension has commenced by Messrs. Gile & Son, and they will vigorously push the work forward to completion. In July 1890 plans were presented for the remodeling of the first floor with changes to the floor plan. Steam heat, electric lights, water and other conveniences were approved. The post office was relocated from the front to the south rear corner of the building. Also an office for the Andover Public Schools first superintendent was located here. 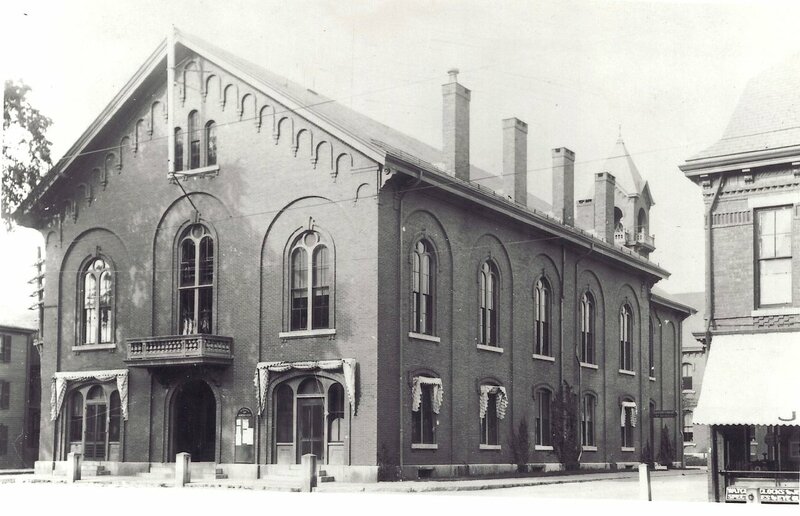 June 13, 1890 p1 George S. Cole began work Monday in the lower town hall, dividing it into three apartments for the Post Office, Police Office and School Committee room. The present Post Office will also be divided into smaller offices for the Water Commissioner, Selectmen and Board of Health and Superintendent of Streets. July 3, 1890 AT pg 4 - Map of plan of Town House first floor renovations. June 26, 1891 AT - Post Master Marland has had a large Post Office sign put up over the main entrance. Jan. 14, 1898 AT – Much needed changes will be made at the police station soon … purchase of three iron cells… to rearrange 1st floor….. In 1902 the town house was remodeled and updated again. Andover native and architect Perley F. Gilbert was hired and $8500 appropriated for the work. The hall on the second floor received a hardwood floor, new kitchen, redesigned stage for improved acoustics and combination gas and electric light fixtures. The main entrance, curved staircases, mosaic floors and town seal design in the entryway were all Gilbert’s designs. The mosaic work was done by the Murdock Parlor Grate Company of Boston and the seal design was executed by Elias Galassi. The former barber shop on the right side was expanded into the adjoining office space to be used as the new town clerk’s office. The school committee meeting room and the office of the superintendent of schools was beyond on the south side of the main corridor. The police chief’s office and scale rooms were in the rear addition with the cells moved to the basement. Hardy & Cole were the general contractors. The public open house was on November 24, 1902. The Hall became the first public meeting space open to the residents for social functions. The first recorded use came one week after the dedication of the building. January 7, 1859 AA – Fri. Eve. – Andover Lyceum – Lecture by Rev. W. R. Alger at Town Hall on “Dr. Kane and the Arctic Crusades”. The lecture series that would develop became an important educational outlet for the residents. The hall was used for town meetings from 1859 – 1936. The Punchard High School graduations took place here from 1903-1936. Plays by professional troops, local productions by school groups and the “Andover Barn Stormers” also entertained the patrons. The hall served as a recruitment location during the Civil War and homecoming celebrations for returning veterans through to World War II. With the opening of Memorial Auditorium in 1936 the town hall use declined. Additional municipal office space was needed and the Hall was divided up to accommodate the growing need of the community. The second floor was renovated again and in January 1959 and the old stage was removed for more office space. The Cyr Construction Co. of Lawrence received the contract which included the renovating the entire second floor. Some As the demand for more space grew some departments were relocated off site. In 1982-83 the former East Junior High School building was renovated for new town offices and the school department. The Town House was emptied and a proposal to raze the building was suggested. 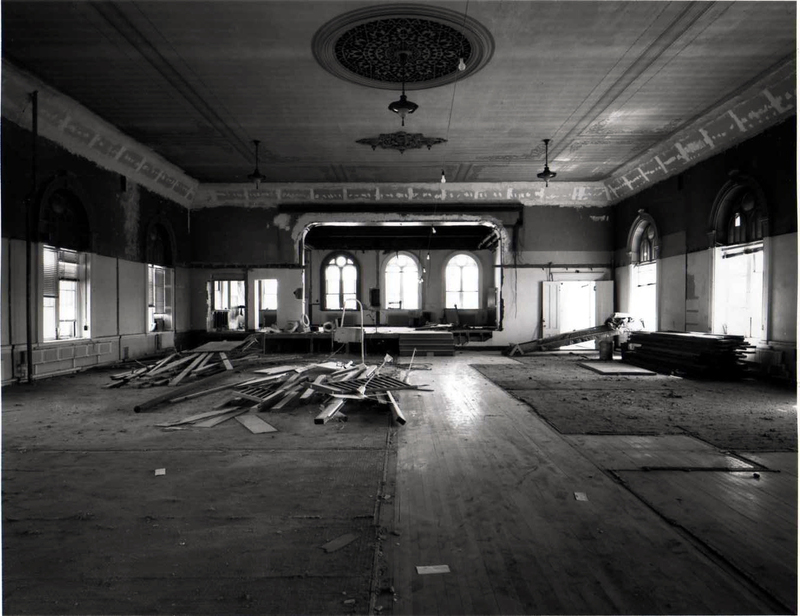 Residents however rallied to “Save Town Hall” and a complete restoration took place in 1988. The Hall was returned to its former glory by architect Ann Beha Associates of Boston. Architect and Andover resident John Dugger was appointed Clerk of the Works to oversee the restoration by Town Manager Kenneth Mahoney. The restored building was rededicated on May 6, 1989. The Town received a Preservation Award from the Massachusetts Historical Commission in 1989 for the restoration and adaptive reuse of the building. During Andover's 350th Anniversary celebration the State Preservation Awards were held at Town Hall. A sub station of the Post Office returned to the town house lower level after a 95 year absence in 1990 and continues to service the center business district. Through the Summer of 2014 the Town Hall was repainted, the stencil work repaired and a new flag pole mounted on the facade of the building. The front pedestrian plaza was once again redesigned and rebuilt. The trees planted in 1988 were removed and granite planter and seating provided. Window restoration and a new slate roof are the next faze of the renovation work. Jan. 22, 1859 AA - “Citizens Ball” at the Town Hall – Wed. evening Jan. 26th. Dec. 20, 1867 AA - Frederick Douglass lectured in the Town Hall, at Andover, last Saturday evening…… article on his lecture. Jan. 10th 1868 AA - William Lloyd Garrison will deliver a lecture in Town Hall on Jan. 14th. Dec. 18, 1869 AA - Ralph Waldo Emerson gave his first lecture of a series of six at town hall. Sept. 25, 1874 AA - The Tom Thumb troupe visited town on Saturday and gave two entertainments at Town Hall. Gen Tom Thumb, his wife Commodore Nut & Minnie Warren comprise the company of world renowned Lilliputians…just made a round the world tour taking three years. Nov. 13, 1874 AA - Wong Chin Foo, Chinese orator to lecture at Town Hall on Monday evening. Town Meetings from 1859 – 1936. Many older Andover residents remember the gala George Washington balls held annually in the ballroom on the second floor. The Annual Fireman’s Ball was also held here. The Hall now continues to be used for a variety of public and private functions since the restoration in 1988. 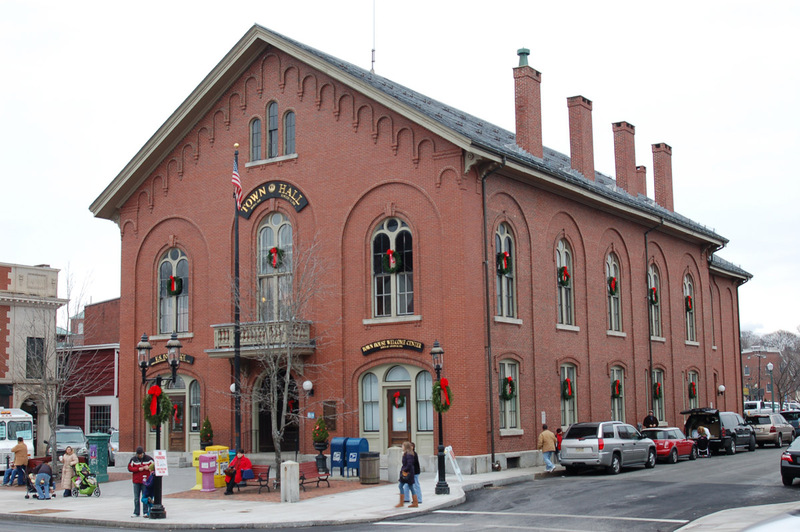 Dec. 11, 1858 AA – The New Post Office – The room fitted up in the Town House for the P.O. is amply commodious and every way conveniently adapted to the wants of the place. The arrangement of boxes is such that any one can see them from the street. April 30, 1859 AA – We understand the Post Office is to be removed next month to the new and commodious quarters in the Town House. All will rejoice at the change, for business of the office is large, and the accommodations should therefore be ample. It is hoped a large number of boxes may be taken in the new office by those not having them in the old one, the evincing on the part on the community an appreciation of the important public improvement. The Post Office was relocated to the town house from the brick block of Henry W. Abbott at 1 Main Street & Elm Square in December 1858. First located on the right front south corner store it was moved over to the left north corner in 1859 and remained at this location until 1895 when the Musgrove building was constructed. May 28, 1859 AA – D. Howarth has hired a room in the Town House, and is fixing it up in excellent style for an apothecary shop. The post office has been removed to the Town House, and the best accommodations are now furnished. Squire Sam says he still has a few boxes to let. In June of 1859 D. Howarth, Apothecary store moved from Essex Street into the vacant store front in the new Town House. On April 28, 1860 the Andover Advertiser reports; Improvement; Our friend Dr. Howarth, we are pleased to notice, has lately had the inside of his drug store, in the Town House, repainted, the drawers remodeled after a very unique and novel design, and other improvements made which add greatly to the appearance of his place. … Dr. Howarth not only has an attractive store, but is a pleasant and honorable man to deal with; and our readers will find here a large and well-selected stock of drugs and medicines, besides the thousand and one little articles that go to make up such a stock. March 22 1867– John T. Shattuck has sold out his stock and trade to Messrs. Corse & Townsend, who will continue the boot and shoe business trade at the old stand. Co-partnership formed. Corse & Townsend will carry on the boot & shoe business at the store in the town house, and also the store in Beard’s building on Essex Street. July 5, 1867 AA The liquor agency has removed from the store of H. W. Abbott to the town house. April 28, 1871 AA – Johnson’s express office has been removed to the shoe shop of Thomas Smith in the town house. Jan. 12, 1872 AA - Postmaster Marland is enlarging his office room and greatly improving its internal arrangements. Oct. 3, 1873 AA – Postmaster Marland is putting in eighteen Yale lock boxes into the post office, which will prove a very great convenience to those who avail themselves of their use. Dec. 12, 1873 AA - Postmaster Marland has received a renewal of his commission for another term of service. The “Major” has given very general satisfaction in the performance of the duties of the office from his first appointment. Jan 16, 1874 AA – The Brick Hotel, C. O. Cummings landlord, Almshouse – large number of trampers, 27 were housed at the town house. Apr. 27, 1900 – AT - p 4 Obit of Jonathan M. Bean – long barber at Town House, came to Andover Aug. 1, 1876 – bought out the barber shop of George Orrell, for past 22 years in Town House. May 18, 1900 Edwin R. Eastman has entered into partnership with Charles Cook and with him will carry on the barber shop in the Town building formerly owned by the late Jonathan M. Bean. June 8, 1900 – New awnings have been placed over the front of Eastman’s barber shop in the Town building. See Institutions, Town "Town House"
Major Alterations 1863 - tower to be added, never done; - 1881-82 - rear addition for enlarged hall and new stage; - July 1890 - Interior remodeling; - 1898 - remodel Police station area add 3 new iron cells; - 1902 - interior remodeling, new foyer entrance; - 1936-38 - Hall remodeled for additional office space, ceiling dropped; - 1959 - second floor remodel stage space used for offices; - 1988 - Complete restoration of building.